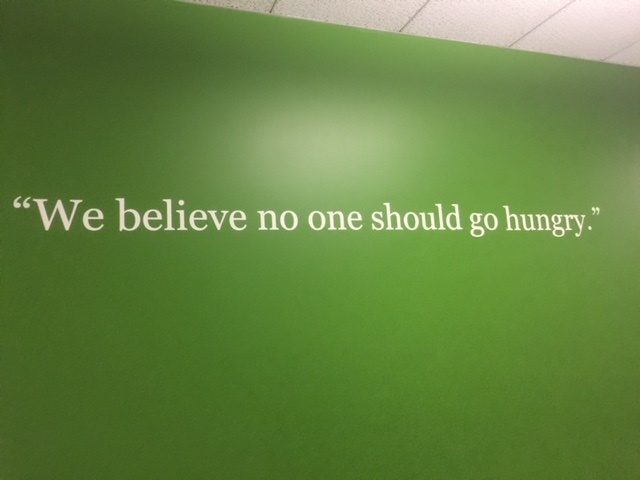 FoodMinds Chicago staff members took time away from the office this week to volunteer at the Greater Chicago Food Depository for some team bonding and to help bring food and nutrition to the community. Volunteers split into two sessions, with the morning group being responsible for scanning bulk goods, building boxes, and packing all foods into 40-pound kits separated by food groups. The afternoon shift of volunteers was tasked with sorting out fresh produce – cabbage and sweet potatoes – for individual families. It was great to be able to step out of our typical working environment and do something meaningful for those in need. Ever the solutions-oriented group, our volunteer teams worked together to find ways to work more efficiently and lend extra assistance: when team members packing the boxes needed extra support, other FoodMinders stepped up to help pack faster; those sorting produce discovered that rolling cabbage heads across the conveyor belt got the leaves off faster, helping to speed up the process and get more produce packed! With just one day of volunteering, we helped get 47,309 pounds of produce packed (the equivalent of 39,423 meals!) and we sorted out 9,948 boxes of food items. It is amazing to see how our combined efforts could make a strong impact on our local communities and we look forward to our next volunteer event!